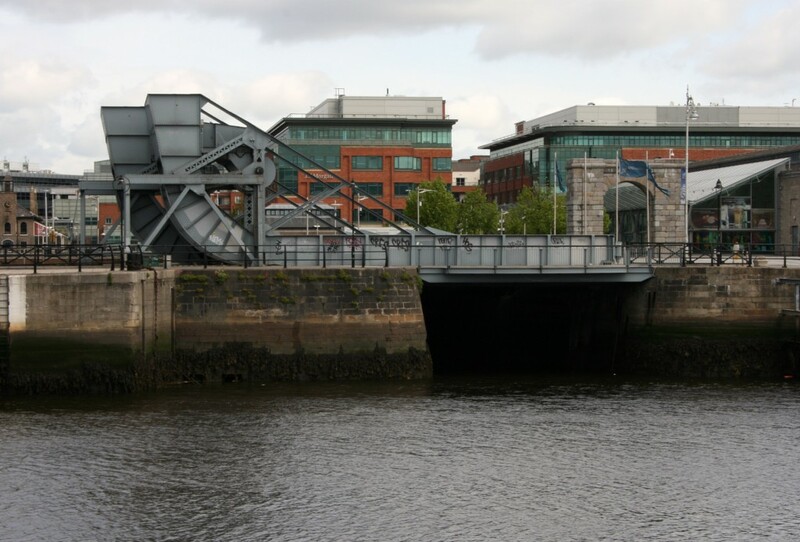 If you have a certain sensibility, passing through the rolling lift bridges along North Wall Quay is as exciting as a city gate or an arch. One pair sits at the mouth of George’s Dock and Custom House Dock, and the other is beside the Convention Centre, crossing the mouth of the Royal Canal. 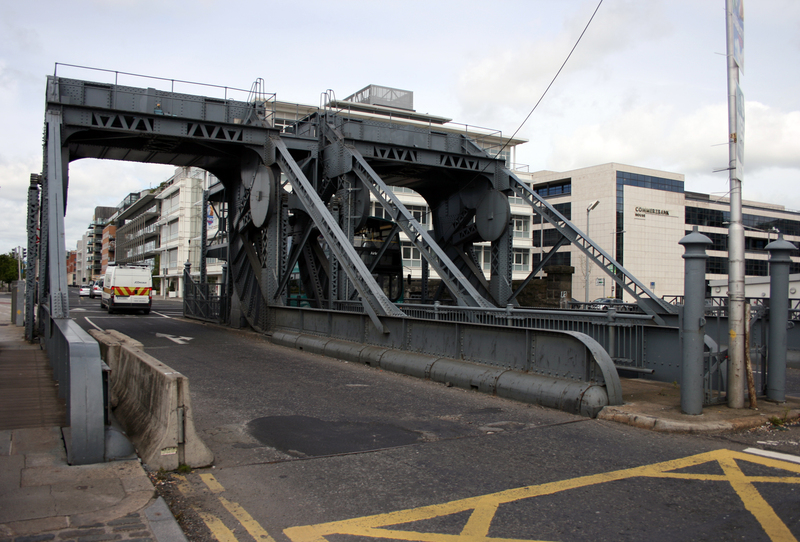 The latter has a plaque recording its construction in 1911 for the Dublin Port and Docks Board – I didn’t look for one on the other, but the bridge type was designed in Illinois in 1909, so I’ll risk guessing they’re of similar vintage. They’re very striking objects. From close up, they’re heavy, functional objects: steel and iron coated in weatherproofing, studded in neat seams, trusses and bolted and welded into place. 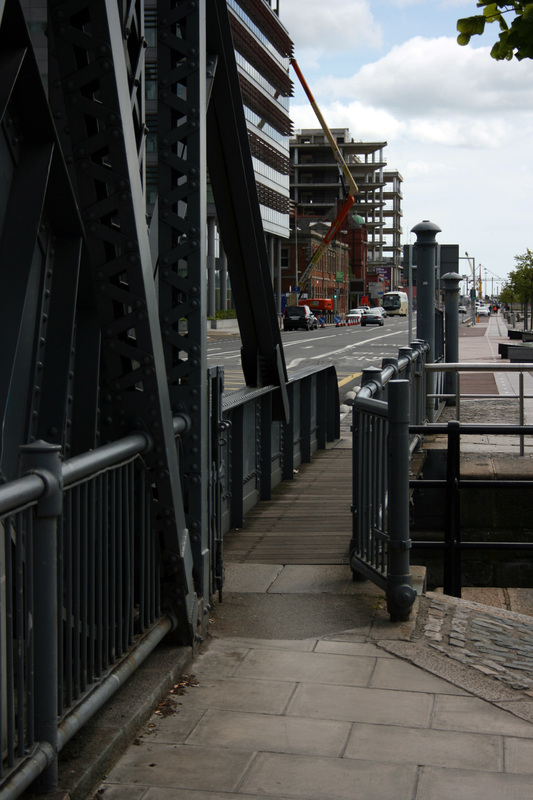 In the current docklands, they’re a reminder of the previous life of the place when they controlled the raising and lowering of the road to allow clearance for access by water. I fell in love with them in the 90s during some early, moody outings with a camera around the red-brick warehouses and eerie peace of the area, and had tons of close-up prints of fixtures and edges, not sure what any of them did but liking how they looked. From the opposite bank of the river, they have an almost organic quality to the form. 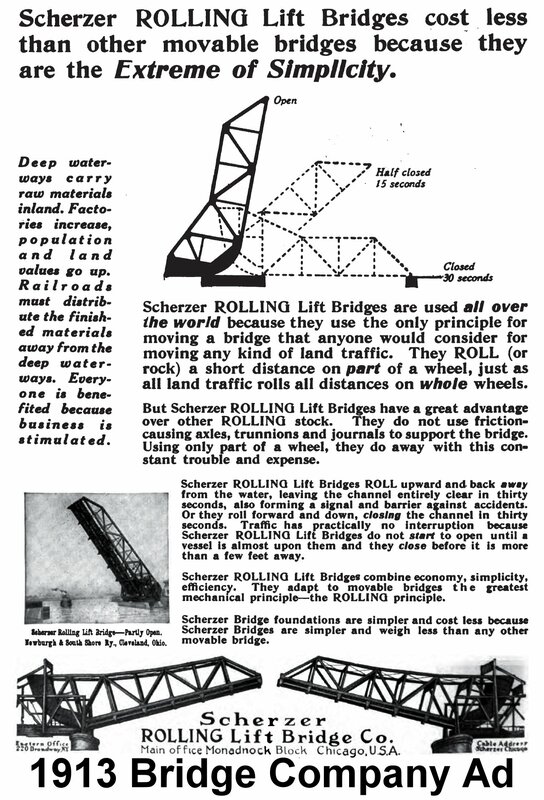 I found the amazing ad below on a bridge-fanciers’ site, and it’s wonderful to see them in motion. The closed bridge seems jubilant and poised, and the opening move is gently acrobatic. The Scherzer Rolling Lift Bridge is a form of bascule bridge, which use a counterweight to balance the movement of the bridge as it opens.